Remove cap from the small, graduated part of the bottle. Squeeze large part of bottle, with cap on, forcing Cat Odor-Off Fresh Scent into the measurement chamber. • Dilute ½ oz. 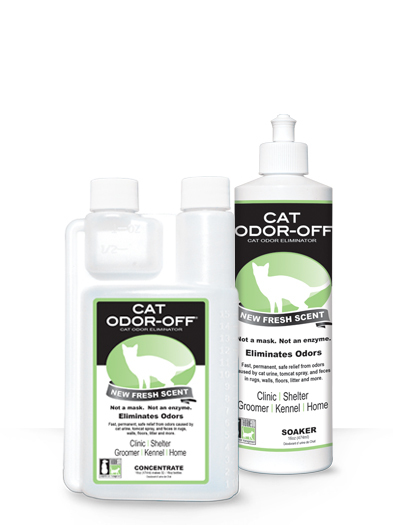 of Cat Odor-Off Fresh Scent Concentrate to 16 oz. of water in a spray or pour-on applicator. Spray or pour on the source of the odor. If on carpet saturate to reach the odor source. Work in thoroughly if possible. Allow to dry. If odor persists after Cat Odor-Off Fresh Scent has dried, the source of the odor has not been reached. Continue to reapply as necessary. Pull up on the applicator cap, point the bottle at the problem area and squeeze. If on carpet saturate to reach the odor source. Work in thoroughly if possible. Allow to dry. If odor persists after Cat Odor-Off Fresh Scent has dried, the source of the odor has not been reached. Continue to reapply as necessary.